Voting4Change Trusted, Safe, Flexible E-Voting. Powered by Yaje Technologies. 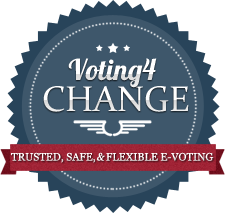 Voting4Change is an independent online voting platform for running elections, surveys, polls, and referendums for associations, unions, corporations, law firms, award shows, non-profits, cooperatives and colleges! Our online voting system aims to revolutionise how you gather consensus in your organisation by providing the highest security, highest integrity and highest quality of voting and surveys. Our solutions offers state-of-the-art technology, security and reliability — that's the promise that Voting4change.com can offer, and we are here for the long-run. © 2012 Voting4Change.com. Powered by Yaje Technologies.